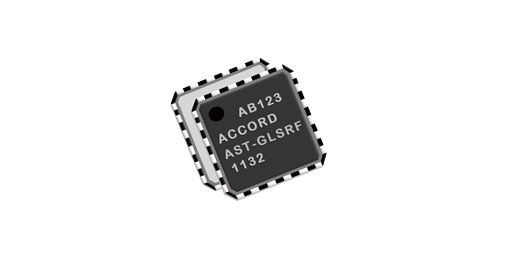 The AST-GLSRF is a high performance, fully integrated, RF front-end chip for down conversion and amplification of GLONASS signals. It has been designed for L1 (1602 MHz). The AST-GLSRF is a superheterodyne receiver, with an on-chip low noise amplifier (LNA), local oscillator, one down conversion IF stage (at 6.120 MHz), an automatic gain controlled amplifier (AGC), an on chip IF low pass filter and a 2-bit analog-to-digital converter (ADC). The down converter works with 16.368 MHz reference clock. The sampling clock for ADC is generated either internally or can be supplied from external source at CKIN. The down converter has an internal IF low pass filter, which does not require external calibration inputs. Antenna connection and open circuit can be sensed and the information is made available. The chip can be interfaced with any active/passive GLONASS antenna.